← the kiki art blog hop(scotch)! Reflections starts today, so stay tuned for pictures from this weekend, but for now I want to share a couple of projects. 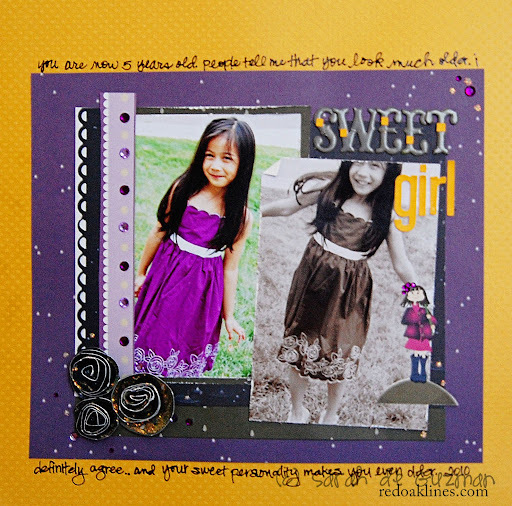 The layout below features Kiki Art‘s Water Rain collection. The colors matched so perfectly with these photos that I took a couple of weeks ago. I used a pretty simple design on this one because I wanted to highlight these GORGEOUS photos of my cousin. I felt that creating something too “busy” would have taken away from the photos, so I left it as is. What are your thoughts? 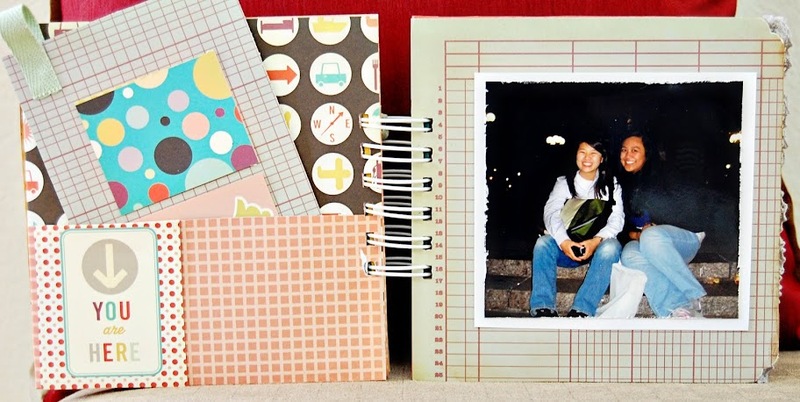 My album looks fairly empty because I didn’t get a chance to journal on all of the pages. I did, however, get around to adding photos from one of my New York trips. For other details on this mini album, read my review over here. Oh, and if you are in the Newport Beach area, stop by Reflections and come say hello! I will be hanging out with the girls from Punky Sprouts. Absolutely adorable work today! I love that purple and yellow page! Just love it… so bold! Love that mini album! 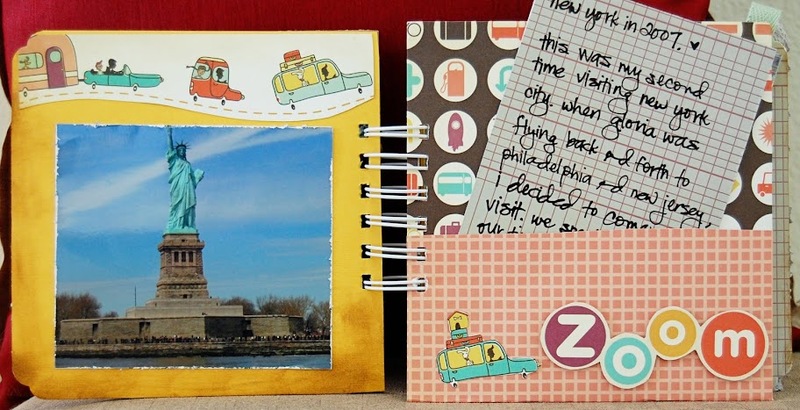 What a great way to highlight photos from a trip! I may have to use this idea at some point… if I can ever narrow down the hundreds of pictures that I take on vacation! lol My honeymoon album has now turned into TWO honeymoon albums. 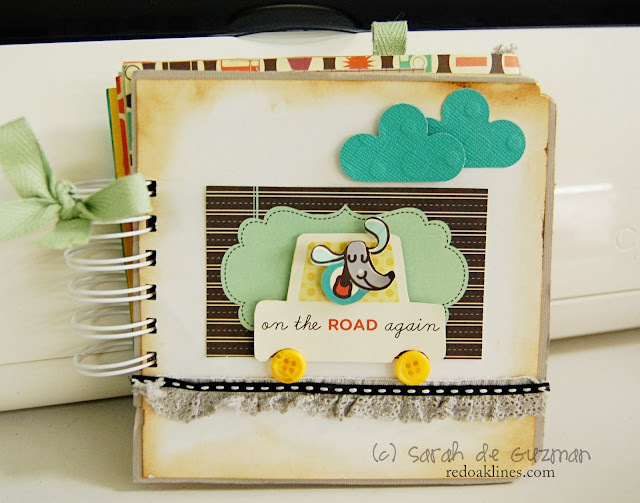 Fantastic projects Sarah, I really really love mini’s and yours is so cute! I think that LO is just perfect, love it!!! And that mini is supercute!!! Ps. I LOVE, LOVE, LOVE the adorable mini!!!! So cute! Adorable stuff here! I am loving that mini… especially the cover! Too CUTE! that mini is SO cute! I love minis, why don’t I do more of them? Oooooh, very cool mini……LOVE IT!!! Just love the layouts!! Great inspiration. Signed up for email. I love the fact that I have a group of good friends I get together with each month to work on our various scrapbooking projects. Happy NSD. Awesome layout. Love the way you changed the papers to fit your ideas. Happy NSD. How cute is that mini?! And I really like the purple and gold together — great color combo! oooh you are soooo clever…. Your layout is adorable! Halloween is my favorite holiday so I love good inspiration!